If you don`t already do it make it a daily habit to read the business news section and share markets information in the newspapers or online. Also look at the business/markets portion of the TV news and generally take an interest in what`s happening in the economy. Use sources such as the NZX website to become familiar with how the share market operates. These are shown on "links" page. If computer literate set up some folders and files to store all applicable information and set up a spreadsheet in excel to chart purchases/sales and dividends. If no access to a computer..keep paper records in safe place and write down transactions in a folder specifically and solely for investments . Some companies have "dividend re-investment programs" (DRIP). With these programs the dividend is retained by the company and is re-invested in purchasing more shares for the investor as opposed to normal process of dividend amount being credited to share owners bank account. Some companies may offer DRIP purchases at a discount to current share price. These may be advantageous for an investor who does not need the dividend immediately and also offer the benefit of no brokerage charges as well as providing a compounding effect over time. If one buys shares as an investment with the intention of holding them for dividends and or growth and subsequently sell them at a profit there is no tax to be paid on any gain when they are eventually sold, as long as the original intention of holding is valid. If however, one buys with the intention of selling for a profit, then this is considered to be "trading", and any profit would be taxable along with regular income. The IRD (The Internal Revenue Department) regard intention as the key, and if audited the investor may well be asked to prove intent. Documentation and good record keeping is important. Also be aware that buying and selling a particular share frequently could well be thought of as disproving the theory that one is holding for long term. It’s the investors responsibility to be able to convince the IRD. One option if an investor is trading, as well as buying for long term, might be to set up two separate bank a/c`s. Depending on how those are managed, this could assist in bringing clarity to the situation. It is probably a good idea to speak with a CPA to ensure everything is set up correctly and the investor is operating within the IRD guidelines. One method of maximizing the effectiveness and benefits to be derived from dividend producing shares is illustrated below. This is best described as a process of firstly choosing the appropriate share that fits the investment requirements profile, secondly buying it at the best possible price and lastly but equally importantly, not having to sell out at a price that would wipe out any gains made from the dividends. To illustrate the concept behind this please look at chart below for MVN from 2009 to 2013. The share price has dropped as low as $1.00 several times and gone up as high as $1.80. Both of these extremes were for relatively short periods of time. 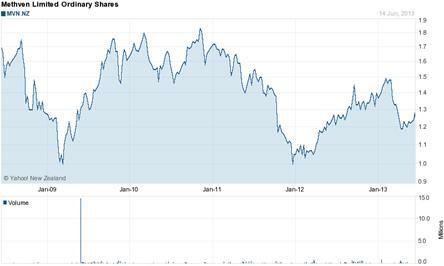 The bulk of the five year period the share price (SP) has been between $1.20 and $1.40. So for arguments sake lets say MVN paid a dividend every year of $0.10. Owning the shares at $1.00 the dividend yield on investment is 10%, buying at $1.20 the yield is 8.33%, at $1.40 the yield is 7.14% and at $1.80 the yield is 5.56%. Obviously it is best to be getting the highest yield, however the window of opportunity to purchase at this share price was very small. Great if you can manage it but a window of several weeks in a 5 year period is bordering on highly improbable if not impossible. However as it gets up in SP to $1.10/$1.20 purchasing shares becomes much more likely. What about buying at the top? A decent yield is still possible, HOWEVER, the elephant in the room is now….what happens if one needs /wants to sell the share? Obviously the possibility has increased that a loss may be incurred regards the share price so this may well have nullified any benefits from the dividends. Picking the time/price to buy is crucial in order to firstly get the best yield and secondly to minimize any potential loss at the exit. It should be pointed out that the above theory is of course, just one of many different ways of looking at investing and all investors should combine their own investment profile with their own requirements in making investment decisions. (A) When selecting shares to invest in gather all the information you can from as many different sources as possible. (B) Have a clear idea of what the goals are and select those companies that fit into those parameters. (C) After settling on the selection make it a habit to watch the Share Price activity on a regular basis to see at what prices the shares are changing hands and with what volumes. (D) Compare current performance to historical performance by the use of charts and by referencing data available on the company website and other sources. Does “it” sound too good to be true? That may well be the case so hold that cheque until you do some more research. Unfortunately most things that sound too good are sometimes accompanied by various “got ya’s”, “should have looked more carefully”, ultra small fine print and weasel clauses. Finally, ask yourself this, “If the company I am considering investing in fails or suffers a serious downturn, how will that affect our financial situation.”? Conservative investing is all about building in some safety margin so you don’t get left in a vulnerable position. Ultimately investment means different things to different people. There is no one way that fits every situation or every person. This is why it pays to examine where you are in your life, what are your requirements and where do you want to be at various points. Talking with friends and family, becoming educated about financial matters and seeking advice from certified CPA’s and registered AFA’s if unsure, are all highly recommended. If you are a new entrant to the share market and are not quite ready to become financially involved there is the option of setting up a "practice" facility so that you can test your understanding and suitability of decisions. This link https://www.nzx.com/login will take you to the New Zealand Exchange and will allow you to easily register and set up some watch lists and also establish a pretend portfolio. Highly recommended as a learning experience.